This is our 9th award for nine consecutive years based on thousands of valuable reviews by our guests. Get now our best deals for your next dream holidays! Cancellation is free of charge up to 15 days before arrival. Imagine a swimming pool right outside your balcony door. 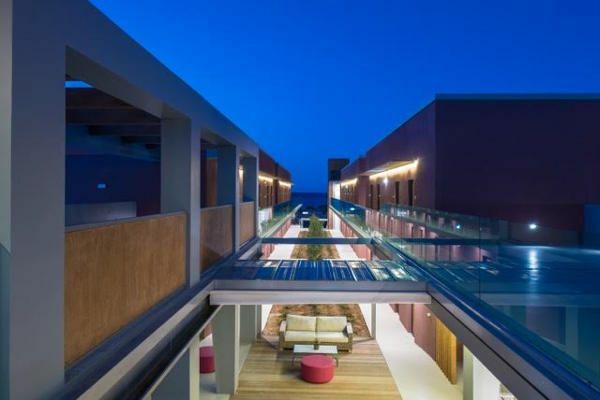 The latest addition to the Corissia resort, built in 2015-16 this hotel is the new "jewel in the crown" of the Corissia Hotels. 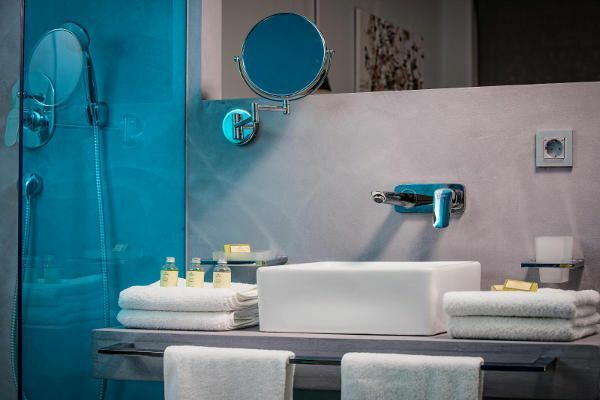 This 4*+ hotel, for adults only, is set in a quiet, but central location, only 80 metres from the beach and only a short stroll from the delightful town square. 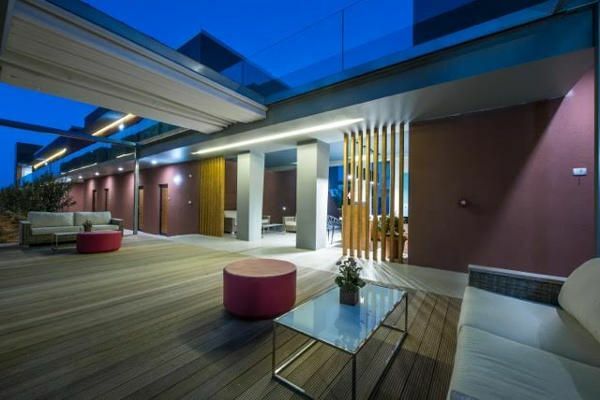 The Corissia Harmony has over 70 luxury rooms which are located in a number of two story buildings, designed by the architect with Harmony in mind. Here you can experience a wonderful mix of contemporary, but elegant design. Spacious rooms and heated swimming pools. All this, combined with the quality and service for which the Corissia Hotels are renowned. The Corissia Harmony stands in a prime location. From here you can, in a few steps, be strolling along the beach or walking around the village where you will find a pretty square with fountains, tavernas, bars and shops…and the working fishing harbour. Of course, should you prefer just to relax at the hotel you have the choice of gardens, pools and relaxing areas complete with sunbeds. The Corissia Harmony is complete with a large reception area, a lounge and lifts. 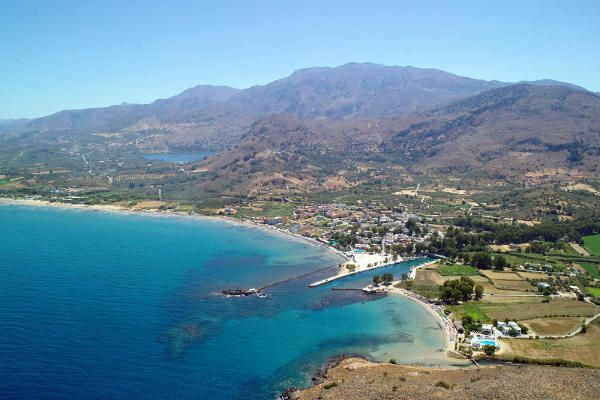 We are pleased to report that the Corissia Harmony has already become very popular with our guests, placed, as it is in a prime location, between the long sandy beach and the delightful village. Just a few moments away is Corissia Park adjacent to the beach. Here you will be able to enjoy a large, fresh water swimming pool, with adjacent childrens pool and childrens play area. A Pool Snack Bar, sunbeds and umbrellas. All set in an oasis of well tended lawns, flowers, towering eucalyptus trees, yet only a step away from the beach. Here you can relax and unwind at your own pace. Our disabled guests can be assured we also provide accessible facilities. There is also free WiFi with internet access in all our hotel premises. 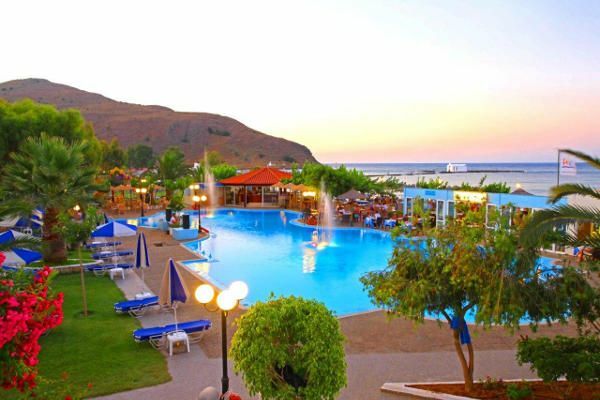 The Corissia Harmony Hotel is situated within the tranquil, picturesque village of Georgioupolis, just a minute walk away both from the sandy beach and the village square. 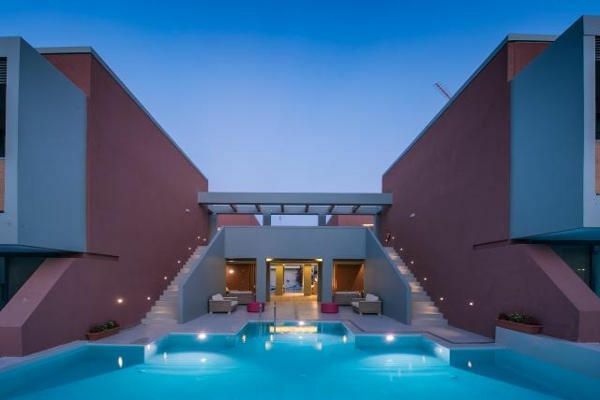 "We have made the pulse of this cosy seaside resort an important part of our hotel philosophy, because that is just what holidays on Crete are all about." All rooms are spacious, comfortably furnished, contemporary and elegant. They measure approx’ 35-40sq.mtrs, including your balcony. Each room offers two 90 x 200 box spring beds, with top quality mattresses. You also have a sitting room area complete with a sofa, armchair, coffee table and spacious wardrobe. A bathroom with separate WC and the luxury of a double shower, plus hair dryer. Patio doors open on to your own large balcony. 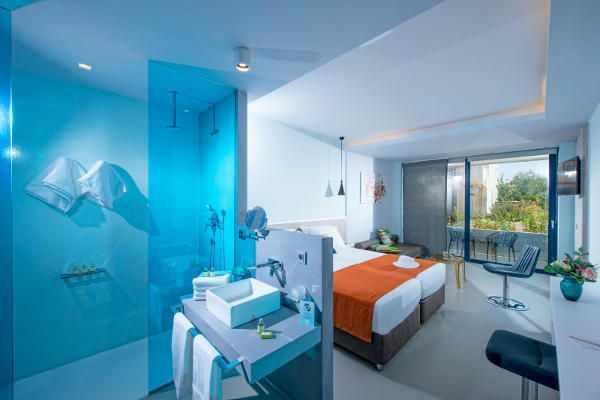 The room also offers air conditioning, a small refrigerator plus the added convenience of a 40inch Smart Tv with internet connection and satellite channels. Free WiFi, a desk with USB/LAN and telephone, kettle and safe. 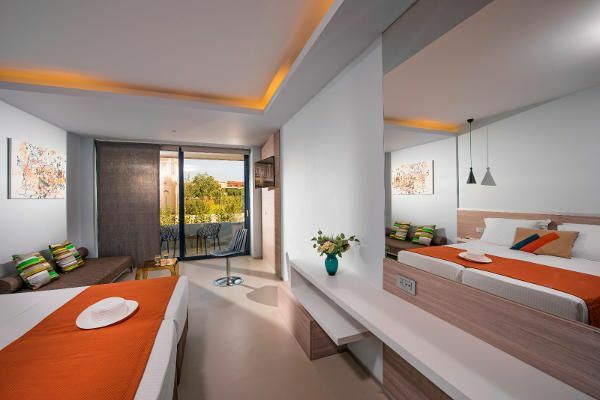 Here at the Corissia Harmony we also offer the luxury of our exclusive superior rooms. They are complete with the same high quality furniture and fixtures as our standard rooms but include, in addition, a private 14m2 heated swimming pool incl. lying surface. With the opening of our new Adults-Only Restaurant Ophelia at the Corissia Harmony Hotel we would like to offer our guests a new, exclusive service, which is usually only intended for exquisite 5-star hotels internationally: Half board à la carte. With half board à la carte we will serve you your daily, rich breakfast and dinner personally and not offer it as a buffet as usual. A fantastic breakfast in the morning and a 5-course dinner await you every day! Our chef prepares for you culinary delights of the highest quality, which you can choose from our menu and enjoy in our new premises. The quiet location and the wonderful ambience of the new restaurant allow you to enjoy your daily meals undisturbed. Half board à la carte is offered at no extra charge to our guests who book their holiday at the Corissia Harmony Hotel including meals. You will find our Cocktail- & Wine Bar Lyra in the well maintained and pretty grounds of Corissia Park located just steps away from the beach and sea. Here we offer an extensive range of cocktails, wines, beers, soft drinks, coffees and teas along with a range of tasty snacks. Here you can relax by the large swimming pool on sun beds on the lawn under the shade of an umbrella or palm tree or on the sandy beach listening to the sea gently lapping. In the evening we offer the same tempting range of cocktails and drinks. Relax and enjoy, whilst the background music drifts over you as you watch the world go by. Would you like to try tasty pasta, burgers, pizza and other snacks by the sea during the day? Simply visit our Pasta Bar - Restaurant Armonia in Corissia Park. We also serve you directly on the beach! 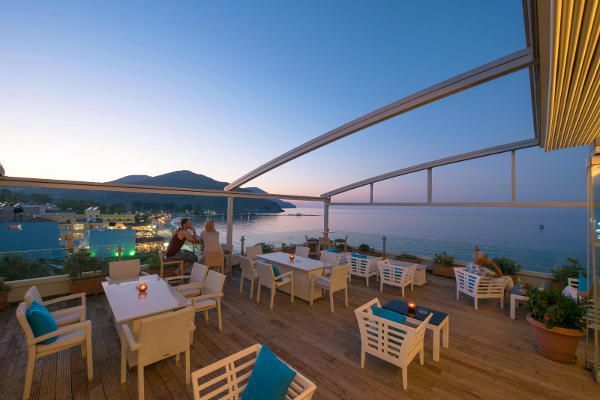 Our exterior glass lift will transport you to this very special cocktail bar on the rooftop terrace of the Corissia Princess Hotel with stunning 360 ° views over the bay of Georgioupolis. Enjoy delicious cocktails, coffees and refreshing drinks of all kinds in a romantic, relaxing atmosphere. Catering of the highest quality instead of all inclusive. 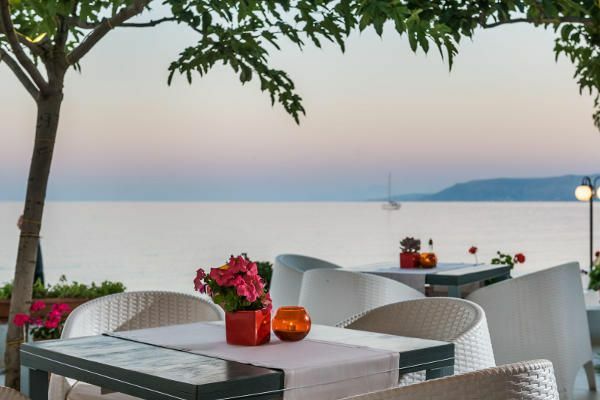 Enjoy your substantial, tasty, buffet-style breakfast and dinner in our sea view restaurant. What’s you preference.. a swimming pool or the sea? Why not simply both at the same time? The spacious fresh water swimming pool with an integrated children's pool in the Corissia Park is just a few meters away from the sandy beach and the sea. The best of both worlds! Once more, here at the Corissia Park we can offer many choices. For guests who wish to sunbathe there are lawns with beach chairs and umbrellas... plus the beach only a few steps away. For others who may prefer a little the shade you can relax under the delightful shade of a stately eucalyptus tree or under the gently swaying fronds of a palm tree, the choice is yours. In both areas we gladly serve drinks, ice-creams and snacks. Again you will find the added convenience of free WiFi in both the park and on the beach. Cretan culture embraces music and dance and it is an integral part of Cretan life. You can experience this combination first hand in the Corissia Park. We regularly offer live music, folklare evenings and dance performances. Relax by the pool with a drink and absorb the atmosphere. If you feel energetic join in... the choice is yours! The Corissia Harmony hotel is quietly and centrally located, only 1-2 minutes from the centre and a few meters away from the beach. Contemporary yet elegant, for guests who demand the best. The hotel is adult only. 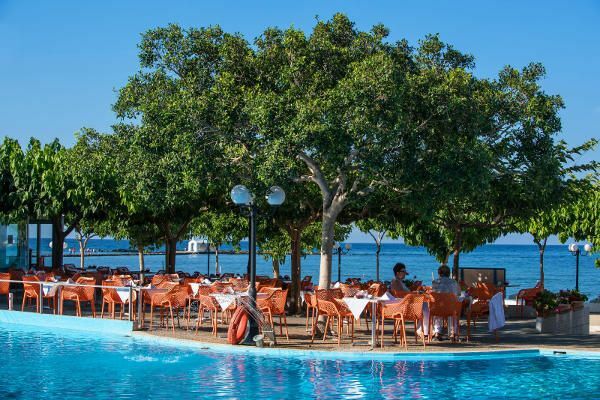 We offer generous hot and cold breakfast and dinner buffet in our sea view restaurant in the Corissia Park located by the sea. In most of our hotel complex you can use our Wi-Fi and get free internet access. The cleaning service is one of our greatest priorities. The rooms are cleaned daily and sheets and towels are changed regularly. Nearby you will find both a bank and ATMs where you can withdraw money with your debit or credit card around the clock. Corissia Hotels accept of course payments with all major credit cards. You can obtain beach towels at our reception. As a guest of the Coee Corissia Harmony Hotel you can get daily a beach towel for free. The bathing towels can be changed daily. 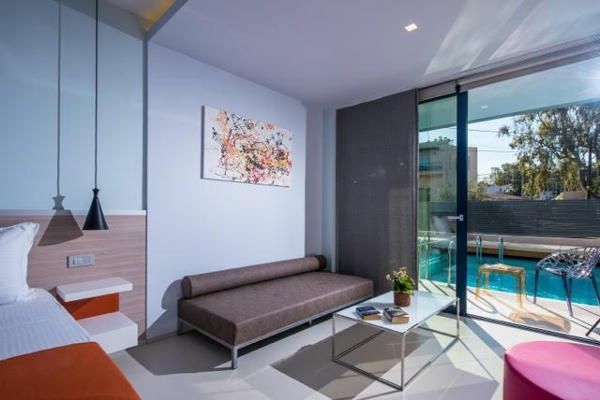 You will find free public parking in the immediate surroundings of our hotel facilities as well as in the free parking area near the fishing harbour across the road from the Corissia Park. In close proximity to our hotels you will find several supermarkets and small shops of all kinds for your everyday shopping. We pay great attention, that all areas of our facilities are accessible to people with disabilities, the elderly or parents with small children. 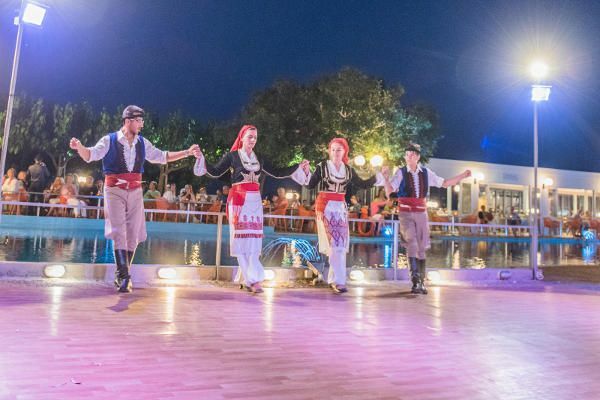 We offer regularly in Corissia Park live music events, folklore evenings, dance performances and various games. On request, we also offer fitness, water aerobics and various sports activities.